Hypothesis Large hiatal hernias are prone to disruption, resulting in reherniation, when repaired with simple cruroplasty. The use of mesh may decrease the rate of reherniation in the laparoscopic repair of large hiatal hernias. Design Prospective, randomized controlled trial. Patients Seventy-two individuals undergoing laparoscopic Nissen fundoplication with a hernia defect greater or equal to 8 cm in diameter. Intervention Nissen fundoplication with posterior cruroplasty (n = 36) vs Nissen fundoplication with posterior cruroplasty and onlay of polytetrafluoroethylene (PTFE) mesh (n = 36). Main Outcome Measures Recurrences, complications, hospital stay, operative time, and cost. Results Patients in both groups had similar hospital stays, but the PTFE group had a longer operative time. The cost of the repair was $960 ± $70 more in the group with the prosthesis. Complications were minor and similar in both groups. There were 8 hernia recurrences (22%) in the primary repair group and none in the PTFE group (P<.006). Conclusion The use of prosthetic reinforcement of cruroplasty in large hiatal hernias may prevent hernia recurrences. A recent study has suggested that the laparoscopic approach may be inferior to the open approach for large hiatal hernia.3 The recurrence rate for open simple cruroplasty in their study, however, was still 15%. Others have demonstrated a similar high recurrence rate (10%-50%) even in the open approach.4,5 The diaphragmatic repair may be more susceptible to disruption because of repetitive stresses of coughing, straining, sneezing, and laughing. Prostheses have been used effectively in other fascial defects such as inguinal hernias6 and ventral hernias.7 Previous preliminary reports by our group have described the use of polytetrafluoroethylene (PTFE) for large hiatal hernia repair.8,9 No investigation with a significant sample size, however, has compared this repair with simple cruroplasty alone. Thus, a prospective randomized study was undertaken to compare the use of PTFE only with simple cruroplasty in minimally invasive hiatal herniorrhaphy. The study was approved by our institutional review boards, and informed consent was obtained from all subjects. All patients with hiatal hernias (types I to IV) were considered for the study. Presence of a hiatal hernia was determined by video esophagogram and esophagogastroduodenoscopy. Patients with dysphagia, odynophagia, or dysmotility on the esophagogram underwent manometry. Any patient with a hiatal defect of 8 cm or larger was enrolled in the study. The 8-cm defect cutoff was chosen empirically. Preoperative antibiotics were given with the induction of anesthesia. Our technique of laparoscopic hiatal hernia repair has been described in detail previously8-11; briefly, the hernia contents and the sac are reduced. The lower 4 to 5 cm of esophagus is mobilized into the abdomen. A cruroplasty is performed with interrupted 2-0 nonabsorbable sutures; each suture incorporates large (≥1 cm) bites of both crural muscle and fascia. In the PTFE group, interrupted 2-0 nonabsorbable crural sutures were placed and tightened up to the point to provide a nontension approximation. For the onlay repair, an oval sheet (13 × 10 × 0.1 cm) of fenestrated PTFE (DualMesh Gore-Tex; W. L. Gore & Associates, Inc, Phoenix, Ariz) was used. A radial slot with a 3-cm defect in the center of the oval ("keyhole") was cut into the PTFE. The mesh was secured to the diaphragm and the crura with a straight hernia stapler (Ethicon-EndoSurgery, Cincinnati, Ohio). The 2 leaves of the keyhole were then stapled to each other. All patients received a 3-stitch (3 cm long), 360° Nissen fundoplication performed over a 60F esophageal bougie. The most cephalad stitch of the fundoplication incorporated either the anterior arch of the right crus (simple cruroplasty group) or the prosthesis and the anterior arch of the right crus (PTFE group). All patients were seen postoperatively at 1 week, 2 weeks, 1 month, 3 months, and then yearly. At 3 months, an esophagogastroduodenoscopy and esophagogram were performed in all patients; a repeated esophagogram was done thereafter every 6 months. Any complaint of chest pain or pyrosis was evaluated with a barium contrast study and a clinic visit. Operative time, hospitalization, complications, conversions, and recurrences were recorded. Two-tailed Fisher exact test and 2-tailed unpaired t tests were performed with GraphPad InStat Version 1.12a software (GraphPad Software, Inc, San Diego, Calif) as appropriate. Significance was defined as P<.05. A total of 628 fundoplications were performed in the period between January 1, 1991, and December 31, 2000. In this patient population, 351 underwent a hiatal hernia repair. Seventy-two patients (11% of all patients receiving fundoplications, or 21% of patients with hiatal hernias) with a hiatal defect of 8 cm or more were enrolled in this trial (Figure 1). There was no significant difference in the mean age between the 2 groups (Table 1). There were no conversions in either group. The operative time was about 30 minutes longer in the PTFE group (Table 1). The increased operative time along with the cost of the PTFE resulted in an increase in hospital charges of $960 ± $70 in the PTFE group compared with the simple cruroplasty group. Only complications that prolonged hospitalization and/or resulted in patient distress were recorded. Thus, atelectasis and urinary retention, which did not delay discharge, were not considered complications. Also, minor abdominal wall hematomas and subcutaneous emphysema were not recorded as complications. Subcutaneous emphysema is often seen in patients after laparoscopic repair of large hiatal hernia. There were a total of 3 minor complications. The 2 complications in the PTFE group included 1 case of pneumonia and 1 of urinary retention that delayed discharge. Both patients did well after appropriate treatment. One patient in the simple cruroplasty group developed a pneumothorax. This complication was recognized close to the end of the surgery by sudden tachycardia, hypoxia, increased peak pressures, and a protruding left hemidiaphragm. The procedure was finished with decreased intra-abdominal pressure. Since adequate tidal volumes were noted, no decompression was needed. Postoperatively, a chest radiograph demonstrated a minimal pneumothorax, which was followed up by daily observation, delaying discharge. In retrospect, the longer hospital stay in this case may not have been necessary. Follow-up ranged from 6 months to 6 years (mean ± SD, 3.3 ± 1.7 years; median, 2.5 years), with no patients unavailable for follow-up. All patients (except 1) had at least 1 year of follow-up. There was no difference in duration of follow-up between the 2 groups. All recurrences were symptomatic, although they were verified by barium contrast studies. Eight recurrences (22%) were noted in the simple cruroplasty group, as opposed to none in the PTFE group (Table 1). All recurrences occurred within the first 6 months. Five patients with recurrence underwent reoperation (1 open and 4 laparoscopic). All patients received PTFE onlay as part of their second operation. One of these patients who required reoperation developed another recurrence. The other 3 patients with recurrence elected not to undergo surgery and to be treated medically. Neither erosions nor strictures of the esophagus from mesh placement were seen. Infectious complications related to the mesh were not observed. Although more expensive and slightly longer, the technique with an onlay PTFE patch for large hiatal hernia results in a lower rate of recurrence. It has been well known that, for appropriate healing, tissues must be held together in a tension-free manner. Inappropriate tension predicts failure of tissue approximation. When performing anastomosis and abdominal wall herniorrhaphy, most surgeons try to follow this principle universally. By the same logic, tension-free hiatal hernia repairs should be performed. If there is excess tension on the hiatal hernia repair, the use of a mesh as a buttress helps decrease the tension on the repair. Also, the onlay patch buttresses the cruroplasty against the frequent mechanical perturbations that the diaphragm undergoes. Our preference is a material that provides little potential for adhesion formation and fistulization, such as PTFE. 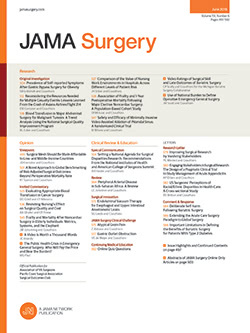 Investigations have demonstrated decreased visceral adhesion formation as well as normal diaphragmatic motion on fluoroscopy with the use of PTFE.28 Repair of congenital diaphragmatic hernias with PTFE yielded excellent long-term results.29 Others17 have used PTFE, although they believed that intracorporeal suturing is necessary for securing the mesh. As described, we believe that the laparoscopic hernia stapling device is sufficient for anchoring the mesh on the diaphragm and crura. Because of the proved risk of recurrence without reinforcement in large hiatal hernias, the use of mesh is recommended. The PTFE mesh provides a buttress when tissue is under tension and especially when tissue is subjected to stress from coughing, straining, retching, or obesity. This investigation demonstrates that the use of mesh reinforcement in laparoscopic hiatal hernia repair, as opposed to simple cruroplasty, eliminates recurrent herniation. Dr Carlson is supported by Mentored Clinical Scientist Development Award 1 K08 GM00703-01A1 from the National Institutes of Health, Bethesda, Md. This paper was presented at the 109th Scientific Session of the Western Surgical Association, San Antonio, Tex, November 12, 2001. Corresponding author and reprints: Constantine T. Frantzides, MD, PhD, Director of Minimally Invasive Surgery, Department of General Surgery, Rush Presbyterian St Lukes Medical Center, Rush Professional Bldg, Suite 818, 1725 W Harrison Ave, Chicago, IL 60612 (e-mail: Constantine_T_Frantzides@rush.edu). Philip E. Donahue, MD, Chicago, Ill: I want to begin by complimenting the authors for an innovative scientific study. It is the largest prospective randomized paper of its type ever performed, and it will be widely quoted for many years in the surgery of hiatal hernia. There are several issues that require discussion and confirmation before this presentation will be seen in its proper context. The first one is about these large type I hiatus hernias and the short esophagus. How do you explain the apparent absence of shortened esophagus? North of the border about 25% of patients with gastroesophageal reflux and hiatus hernia have shortened esophagus, and yet just south of the border (I'm not sure what latitude Milwaukee is), the shortened esophagus appears. Have previous reports overestimated the incidence of short esophagus? Has widespread use of H2 blocker or proton pump inhibition eliminated transmural shortening or transmural effects of reflux and consequent shortening? I wonder, as a corollary to my first question, how many of your patients with less than 8-cm hiatus hernias developed recurrences. The total absence of recurrence in the 8-cm group treated with mesh is really amazing, and it is a startling conclusion that will lead all programs to change their recommendations regarding mesh repair with large hernias. The next question is about mesh repair: How about the more traditional things such as excision of the sac, complete reduction of the herniated viscus beneath the diaphragm, and careful suture approximation of the wrap with the fundoplication? If the use of mesh in all of the patients will help most of us avoid a 22% recurrence rate with large hiatus hernia, mesh use must become a routine. I recognize the weakness of many American studies that don't have long-term follow-up, but our lack of unified systems and various patient factors will prevent better longitudinal studies for some time. In conclusion, I believe this is a compelling study. The authors deserve special recognition for an outstanding project, and I thank the Program Committee for the honor of beginning this discussion of the paper and accompanying manuscript. James A. Madura, MD, Indianapolis, Ind: I enjoyed this paper very much and I wonder in your previous experiences what role G tubes have played. We've always felt that doing this, particularly in open operations, kept the stomach in the intra-abdominal position much better than when we did not use one. Have you had experience with this in any of your studies? Bruce M. Wolfe, MD, Sacramento, Calif: One of the concerns that many of us have had is that late erosion of mesh through the esophagus may occur. I note that you wrapped the mesh all the way around the esophagus. It might be equally satisfactory to close the hernia defect without putting the mesh all the way around the esophagus, thereby reducing the risk of late mesh erosion of the esophagus. How did you decide you need to completely encircle the esophagus with the mesh? Dr Frantzides: First, I would like to thank Dr Donohue for his kind comments and insightful questions. Regarding Dr Donahue's first question about the short esophagus, as I mentioned in my presentation, we have not seen a single short esophagus, and I don't think it is a matter of latitude or a matter of geographic location. With large hiatal hernias, especially with the open approach, we had great difficulty to reduce the hernia content to visualize. I think it comes down to being able to mobilize the esophagus. The length of the esophagus is there; because of the inability to reduce the esophagus and the contents, we thought that we were dealing with short esophagus. That is why it is becoming more of a myth that there is such a thing; if it exists, it is in an extremely small percentage. As far as the recurrences, I don't think it is a matter of technique because we used exactly the same technique in both groups. Both groups received posterior cruroplasty. It was done with the same sutures, and it was done in the same manner, incorporating good bites on the crura. I have to admit that at times in certain patients, when you do the cruroplasty, you know more or less from the time that you complete the cruroplasty that this is going to recur. At times you see separation of the crura fibers, so I don't think it is a matter of technique. What made the difference was the reinforcement with the prosthesis. As far as the numbers of the smaller hiatal hernias and the number of recurrences, we are putting a paper together and my fellow will be gathering those results. I don't have these off the top of my head right now, but it was much smaller. It was approximately 3%. Concerning Dr Madura's question about gastric (G) tubes, at the Medical College of Wisconsin we were using the G tube after every open case of hiatal hernia repair due to primarily the bloating syndrome that these patients have. Since we had to use an NG tube for a long time, we felt that the G tube was more appropriate in these patients. At the same time, the G tube was thought to anchor the stomach. With the laparoscopic approach I don't think that we need to do that, since patients do not experience the bloating syndrome. If anchorage of the stomach is the objective, I don't think that the G tube would be the appropriate method; maybe a gastropexy would be a better way. But in this study, obviously, we didn't explore that option of the gastropexy. I don't feel it is necessary. The disruption of the hiatal herniorrhaphy is the main and most important issue in the reherniation. Lastly, regarding Dr Wolfe's question, as far as erosions by the polypropylene mesh, there are several studies that have shown that it can erode through the esophagus, whether it is put circumferentially or reinforcing only the posterior cruroplasty. PTFE has been shown with the ventral hernias and other types of hernias that it is less prone to erode through tissue. As far as the circumferential placement, I feel that it is the best way to place the mesh because it anchors it better around the esophagus. Also, it is not only the posterior part of the crura that is weak; it is also the anterior part. So by placing the mesh circumferentially, you reinforce both the anterior arch as well as the posterior cruroplasty.